Pemmican – Superfood for Centuries! Pemmican is a concentrated mixture of fat and protein used as a nutritious food. The word comes from the Cree word pimîhkân, “pemmican”, which itself is derived from the word pimî, “fat, grease”. It’s a recipe that was developed by North American Indians in which lean meat from large game, such as buffalo, elk, or moose, was sliced and dried in the sun or in the smoke of a fire, then ground into powder using rocks. The meat powder was sometimes mixed with available berries and then put into a rawhide bag. After that, melted fat was added to the mixture to complete the recipe. 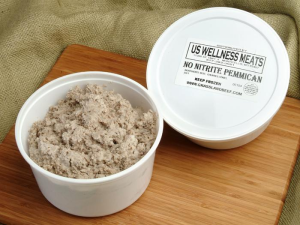 During the fur trade of the 18th and 19th centuries, pemmican was dietary mainstay. It was also heavily relied upon by European explorers as they ventured through North America. Arctic explorer Vihljamur Stefansson also chronicled his consumption of pemmican during his early 20th century Alaskan explorations. Pemmican does not need to be cooked or heated. Some prefer the firmer consistency when the bars are pulled directly from the freezer and allowed to thaw for 5-15 minutes. Other customers eat the bars at room temperature. It just comes down to individual preference. Pemmican consists of a blend of tallow (40%) and beef jerky (60%). Our pemmican is offered with or without dried cherries and raw honey. Dried cherries are added as a natural preservative and additional energy is obtained from honey. Pemmican was–and still is–a wonder food. I consume one pemmican bar nearly every morning to start the day. I pull it from the freezer and score the package on 3 sides with a sharp knife. After 15 minutes at room temperature it is perfect for consumption. The bars will get quite soft at 80 degrees and a bit mushy but may be re-frozen. Consuming one before workouts is a good method of adding fuel for workouts. One bar post-workout is also good nutrition management for tissue repair. For some of our customers, pemmican is a novelty to try. For others, the Pemmican becomes a staple of their everyday diet for a natural, healthy source of energy. If your palate is ready to enjoy real, unprocessed flavors, we think you will find the pemmican satisfying. Many of our customers, especially trainers and athletes, absolutely love our pemmican to the brink of addiction. Our Pemmican is offered in both bars and pails. 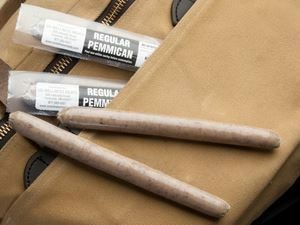 Some customers buy the pails and make their own “bars” by forming the pemmican in various sizes on wax paper. Then, the Pemmican is re-frozen and a variety of sizes are available (even snack size pemmican bars!) when quick energy boosts are needed. We are using a Cherokee recipe but the reason we have limited shelf life is our processor is unable to grind air dry pemmican with their equipment. The processor is leaving more moisture than the Native Americans in order to grind the jerky without damage to the grinding equipment. The Native Americans removed all the moisture and their product was shelf stable. The remaining moisture also makes our pemmican softer and easier to enjoy. We consider our version an “everyday” pemmican. It is an excellent combination of fat and protein intended for ease of eating on the go, as meal replacement, or for extra energy. We have tried the shelf stable, brick hard varieties of homemade pemmican over the years; ours is not that type of non-perishable, survival food. We do offer the raw ingredients if you want to make your own survival pemmican though! Beef Tallow and London Broil Steaks are excellent for small homemade batches of pemmican. Mark’s Daily Apple has an excellent pemmican making tutorial too. Even if you don’t fall in love with eating the pemmican as a stand alone product, it is a wonderful addition to stir-frying vegetables or frying eggs as suggested on our website. 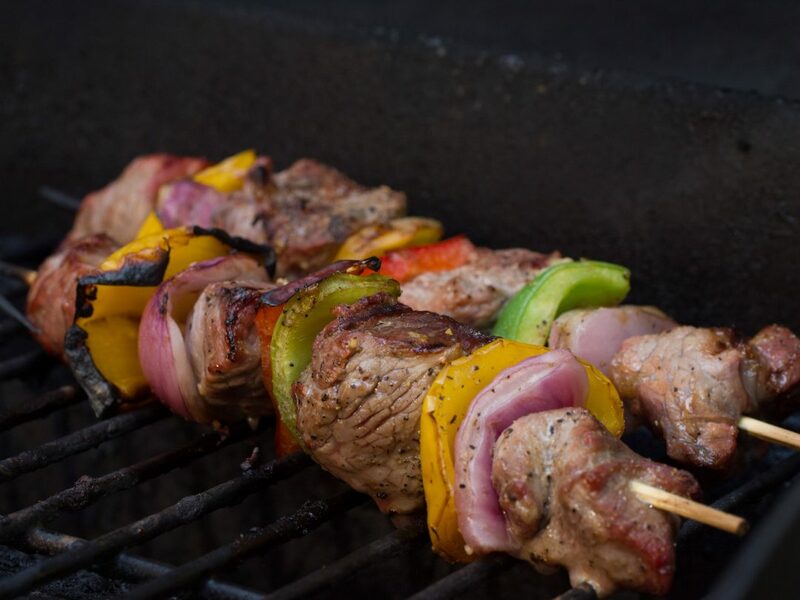 We have also received feedback from customers that gradually became accustomed to the deeper, more subtle, natural flavors of grass-fed meats. Thus, they tried the pemmican again and had a better experience. We appreciate your interest in our pemmican. Feel free to email us as we always like to hear customer feedback about our products!